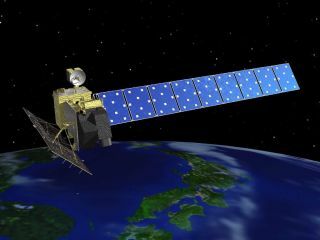 Artist's concept of Japan's Advanced Land Observing Satellite (ALOS), also known as Daichi. Japan's Earth-observing satellite Daichi is dead in orbit, three weeks after a mysterious anomaly crippled the spacecraft, the nation's space agency announced today (May 12). Daichi, formally known as the Advanced Land Observing Satellite (ALOS), unexpectedly powered down on April 22 for reasons that remain murky. The Japanese Aerospace Exploration Agency (JAXA) repeatedly tried to re-establish communication with Daichi over several weeks, but finally threw in the towel today. "We decided to complete its operations by sending a command from the ground to halt its onboard transmitter and batteries at 10:50 a.m. on May 12 (Japan Standard Time), as we found it was impossible to recover communication with the satellite," JAXA officials said in a statement. The death of Daichi (which means "Earth" in Japanese) is not a complete failure, JAXA officials said. The satellite craft launched in January 2006 with a planned mission lifetime of three years, and had already outlasted expectations, they added. The Daichi satellite was an all-purpose Earth surveyor, tasked with helping map the planet, scout for resources and measure changes in land cover such as deforestation. During its five-year life, Daichi snapped about 6.5 million images of the planet from an altitude of about 435 miles (700 kilometers), according to JAXA officials. The satellite beamed down many useful images of Japan's ravaged eastern coast after the devastating earthquake and tsunami of March 11, 2011. It was during this observation campaign, which lasted well into April, that the power glitch that signaled its death first arose. JAXA will continue investigating what caused Daichi to power down in April, agency officials said.